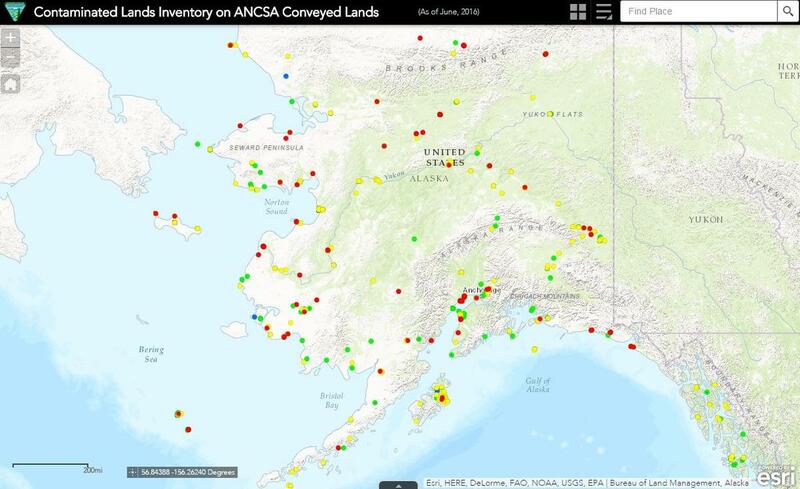 The BLM put together an inventory of 920 contaminated sites conveyed to Alaska Native Corporations, color-coded to indicate sites that have already been cleaned up, and those with work still to be done. Scattered throughout Alaska are hundreds of pieces of land that have been transferred to Alaska Native Corporations by the federal government. Some of it is the land of Alaska dreams: forests, tundra, river banks – largely untouched. Other parcels are less picturesque, but chosen for an economic development purpose. And some, for whatever reason they were chosen, came with contamination: old schools, tank farms, other structures and even some spills. Getting them cleaned up has been a decades long process, and a new report catalogs those contaminated sites, but leaves some questions about who will orchestrate cleanup – and when. About 1,000 sites considered contaminated were transferred from federal entities to Alaska Native Corporations, including storage tanks at the post office site in Iliamna; soil issues at the Katmai National Park Headquarters; a tank farm in Newhalen; and the former school in Pedro Bay. Since the Alaska Native Claims Settlement Act was signed in 1971 as part of the effort to extinguish aboriginal title to lands, the Bureau of Land Management has acted as the government’s real estate agent, and been responsible for transferring each parcel to corporations. At Congress’ direction, the agency published its report on where those conveyances stand this summer, including an inventory of the sites with a map available and searchable online to discover where the parcels are and what is happening on them – or needs to happen in the future. The BLM looked at each of 6,000 sites thought to be conveyed under the settlement act, and determined who the landowner was before transfer, to whom it was transferred and when that happened. Doing so drew on databases and information from several agencies, both state and federal, and BLM deputy state director Erika Reed said it was the first effort of its kind. Much of the push for the report came from an ongoing concern over whether land was being cleaned up. The preliminary inventory offers information about the land’s current status, though it makes no promises as to future work. Bristol Bay Native Corporation Associate General Counsel Daniel Cheyette said that the process, which stakeholders see as slow, has been frustrating. It’s also frustrating that the BLM does not have ownership over the next steps beyond the report, Cheyette said. The Alaska Native Village Corporation Association has worked on the issue for decades, and spokesman Brennan Cain, who is vice president and general counsel for The Eyak Corporation, said the slow process has been frustrating to stakeholders. “It is unacceptable that 45 years after the passage of ANCSA to settle aboriginal land claims, Alaska Native Corporations continue to face legal exposure for contaminated lands conveyed to them by the Federal government,” he said, adding that the corporations want to see a clear path to cleanup. While the BLM can do an inventory, it has said it doesn’t have the authority to do the cleanup, said Maureen Clark, a BLM public affairs official. The BLM transferred some of the parcels from its own lands, but those are not thought to be contaminated. Instead, the U.S. Army Corps of Engineers, the U.S. Air Force, the Federal Aviation Administration and other entities all played a role in causing the contamination, and are likely to be responsible for some sites. But the BLM can’t make them clean them up, said project manager Paul Krabacher. Instead, the BLM report makes some recommendations: finalize the inventory, so that there is a complete picture of the lands’ status right now, and put together a working group to develop the next steps. And, it hands over much of the responsibility for coordinating the work that is left to the Alaska Department of Environmental Conservation. DEC contaminated sites manager John Halverson said his agency can do some of the work outlined in the recommendations, but not necessarily all of it. “There hasn’t really been final decisions made on specifically what’s going to happen in response to the report, but DEC’s mission does include making sure that contaminated sites are investigated and managed properly and cleaned up appropriately,” he said. For instance, the state’s on-going budget concerns might make it particularly difficult for the agency to manage the new inventory database that the BLM put together, or take on other new work, Halverson said. “We are taking a look at the orphan sites in this report and trying to figure out if any of those are high priority sites to make sure we can move those along as soon as possible, but trying to work out agreements between multiple parties that may be responsible or liable for contamination can take quite a bit of time,” he said. The agency is looking at funding sources, such as state and Tribal brownfields program resources and other federal programs, to help with the work, Halverson said.